NOTE: "Tranya" is the only seller authorized by "TRANYA". Please don't place your order from other sellers. 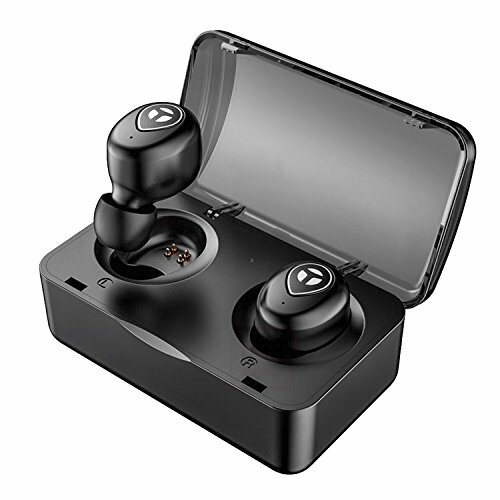 [HD SOUND WITH DEEP BASS] Featuring Bluetooth 5.0 and lossless HD rendering technology that produce incredible sound quality with deep bass and crystal crisp treble. Tranya true wireless earbuds can block out a lot of surrounding noises, and do avoid wind noise created during running, biking, jogging, etc. [STABLE CONNECTIVITY] Provide stable and seamless connectivity with Bluetooth 5.0 and high sensitivity antenna enabled devices up to 33 feet away, which also ensure low latency and low energy features during data transmission. [EASY TO USE] The earbuds automatically turn on and connect your smart phone when removed from the case; automatically turn off and charge when put back in the case. Also, the headphones can be used to answer/reject calling, skip/play/pause songs, and activate voice assistant, such as Siri. [Secure Fit& Mini Design] Extremely light weight and mini in-ear design with two pairs of ear tips to ensure your headphones stay comfortably firm in place and improve the experience on sports. [HOW TO CONTACT US] (1) Dear customers, we would like to make clear that: From your review, Amazon do not provide the access to your order details. So, we hardly have any chance to contact you to solve your issues. (2) You are fully covered by our 1 YEAR WARRANTY and 30 DAYS RETURN GUARANTEE, all you need to do is write to us directly at the buyer center or support email, or leave a feedback to us. We would respond within 8 hours normally. If you have any questions about this product by TRANYA, contact us by completing and submitting the form below. If you are looking for a specif part number, please include it with your message.